Setting: Charlie Brown and his friends are in primary school. Many schools put on a Christmas play for parents every year, and these children are preparing for such a presentation. 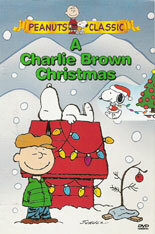 Snoopy: Charlie Brown's dog, though he acts almost like a person in these cartoons, and he has a great imagination! Note 1: Charlie Brown (they always use his full name) has come to symbolize the child who is unpopular because of his looks, handicap or reputation for "bad luck." Things don't naturally "go right" for this character, but he never gives up. This optimism in the face of difficulty has given Charlie lots of fans for over a generation. Note 2: Because of the popularity of this classic, a ugly tree at holiday time is sometimes called a "Charlie Brown Christmas tree." *commercialism: (negative) an overemphasis on making money instead of selling quality products or focusing on the deeper meaning of a holiday, birthday, etc. *to memorize: to put something into your memory (e.g., to learn a poem by heart). Note: Chinese English-learners often misuse this word by saying they memorize a person or historical event (which is not possible); you remember or honor people, and they can be memorialized (a passive verb) for their contribution or example. We commemorate events or contributions. We can also remember our loved ones at a memorial service after they have passed away. People sometimes build a memorial or monument to pay tribute to or honor (or memorialize) a person or event. 1. Studies show that a lot of people get depressed during or just after holidays like Christmas. Tell your partner why you think this happens, and what depressed people should do about it. 2. According to Charlie Brown's friend Linus, what is Christmas all about? Explain it to your partner. 3. Charlie Brown refused to "just go along" (agree) with what everyone else thought was normal when he felt sure there was something better or more meaningful available. When it is good to "go along" with everyone around you, and when is it better to find or make your own way? See our Website Standards and Use Policy regarding the sources of definitions used on this website. This resource was created for our students under our understanding of "fair use" for educational resources. This page does not imply any consent from or relationship with the publisher(s) or producer(s).